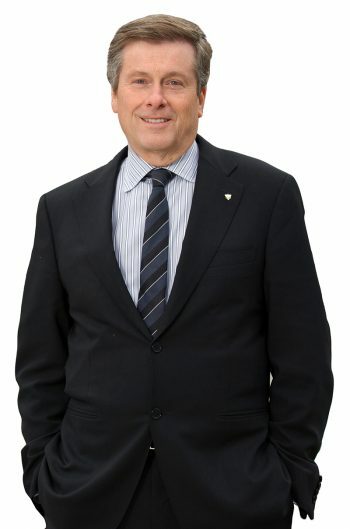 Born and raised in Toronto, Mayor Tory has spent his life giving back to the city he loves, through his tireless work in public, private sector and philanthropic roles. Elected as the 65th Mayor of Toronto in 2014 and re-elected in 2018, John Tory is making the city more liveable, affordable and functional. He has improved the way people move around this city, fighting traffic congestion and speeding up major construction projects; introducing free transit for kids 12 and under and discounted transit for low income residents; championing a transit network expansion plan that includes the Relief Line, SmartTrack, the Eglinton East and Eglinton West LRT, Bloor Danforth Subway Extension to Scarborough and the Waterfront Transit Network; and securing $9 billion in transit investments from other levels of government – the single biggest infrastructure investment in this city’s history. He has kept taxes low, while investing in priority services including affordable housing and poverty reduction, and modernizing the government services on which people rely. Under his leadership, Toronto has attracted jobs and investment and emerged as an undisputed centre of innovation and opportunity on the world stage. Mayor Tory and his wife Barbara have been married for 40 years, and have four children and five grandchildren.